As far as live albums go, Acoustic at the Ryman is a bit of an anomaly. The record was recorded over two nights and features a selection of ten stripped-back songs. Other than crowd noise and the occasional “thanks, y’all,” there is little to capture the magic of a live performance. Fans would have been better served by an official bootleg of an entire gig or an acoustic, one-take studio performance, but it’s a little unfair to judge this album for what it isn’t rather than what it is. 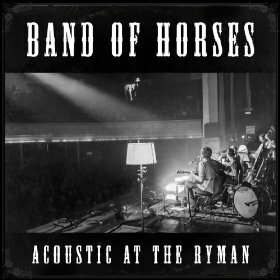 Indeed, if you like Band of Horses, Acoustic at the Ryman is pretty damn awesome. One of Band of Horses’ greatest assets has always been their vocal prowess, and this setting allows them to showcase their harmonizing skills and frontman Ben Bridwell’s enjoyable twang. Songs like the plaintive “Detlef Schrempf” and “The Funeral” shine, while the crowd clapping along to the beat of “Older” is a welcome bit of live interaction. However, this isn’t Nirvana’s Unplugged. Band of Horses have always been rooted in melody, so going from electric to acoustic does little to change the song other than remove certain tonal qualities. Is it cool? Sure, but it isn’t going to win the band any new fans. If you’re into the group already, this is worth checking out, but it won’t be making waves any time soon.